Home Popular Shadab, debutant Faheem save the day! Shadab, debutant Faheem save the day! DUBLIN: Shadab Khan and debutant Faheem Ashraf saved the day for Pakistan against Ireland as wickets kept falling at Malahide on Saturday. –Ireland maintain grip after Pakistan’s top order collapse on inaugural TestDUBLIN: Shadab Khan and debutant Faheem Ashraf saved the day for Pakistan against Ireland as wickets kept falling at Malahide on Saturday. 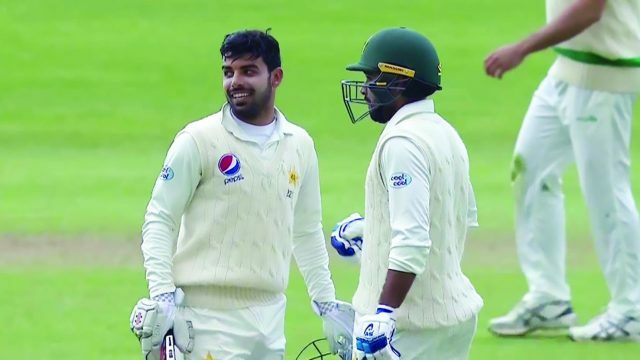 Pakistan, who had seen Shafiq make 62 as they recovered from losing two wickets in successive balls to be 13 for two, were 193 for six at tea on the second day after being sent into bat by Ireland captain William Porterfield following Friday’s first-day washout. Boyd Rankin, the 15th man and the first since Kepler Wessels (Australia and South Africa) 25 years ago to play Test cricket for two nations after making a lone appearance for England, had the honour of taking Ireland’s first Test wicket. There was drama at a sun-drenched Malahide even before the wickets fell, with Pakistan debutant Imam-ul-Haq injured off the first ball of the match. Pakistan, 67 for two at lunch, lost their third wicket soon afterwards when Haris was caught in the gully by Porterfield off Thompson.